HX3.5 should be installed by a qualified technician only. You should be familiar with ribbon cable mounting, crimp contact installation and soldering of delicate parts. Important: Boards contains static sensitive components. Be sure to use anti-static tools and grounded soldering toolset. HX3.5 firmware versions are available for MIDI control as well as direct keyboard control by means of our FatarScan2, Scan61-Inline, and Scan16-Strip boards. A complete set of PDF schematics including peripherals is available for download on our Update/Schematics Page. Default jumper setting: Insert JP6. Insert 2 jumpers on PL10 pin 2-3 and 5-6 (leftmost pin is 1) for secondary MIDI IN. The board may be powered either from coaxial DC input PL10 (5.5/2.1 mm plug, plus on center pin, DC 9V 500mA wall wart) or from green DC connectors PL12 (9 to 12V input) or PL11 (5V input; 5V output when power provided to DC jack PL10 or PL12). Voltages exceeding 5.2V on PL11 will destroy the board! If you have to use an external 5V DC supply on DC input PL10, insert JP2 (near DC jack). We do not recommend this configuration since inadvertently connecting a DC supply with more than 5V output will destroy the board! After powering on, a red LED near PL17 will flicker briefly; it will also flicker when the HX3.5 controller is busy. When the RealOrgan Sound Engine is ready, a yellow LED will dim; it will "breathe" with rotary simulation speed. When the Effects/GM DSP is ready, a blue LED will flash every second. The blue LED will blink when the DSP is ready to accept a DFU firmware update by USB. From Factory HX3.5 boards are programmed with HX3 MIDI Expander firmware (no analog inputs). It should deliver a basic organ sound on audio outputs with MIDI input even with no other peripherals connected. Basic functions are available if a MenuPanel is connected. You have to set at least some System Init parameters after installing a different firmware. See Installation by HX3.5 Editor section below. Our MenuPanel allows convenient adjustments of various HX3 parameters to tweak your setup. Two versions available, short one without indicator LEDs intended for organ installation. Connect HX3 MenuPanel to PL21 PANEL using a 10-wire flat ribbon cable. HX3 MenuPanel may be used in parallel/simultaneously with Preset12-2 and Preset16 boards connected to PL21 PANEL. Extend a flat ribbon with additional connector to your cable on PL21 PANEL or use unoccupied 10-pin header on (last) Preset16 board which also carries the PL21 signal. PL21 carries an I2C bus system where all devices are wired in parallel. 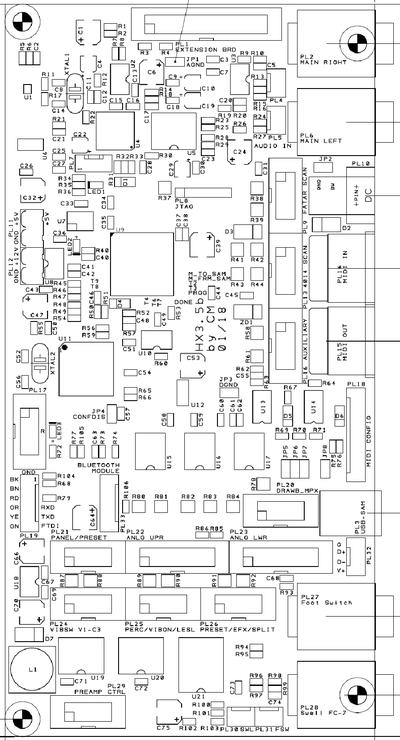 See page HX3.5 Mainboard User Manual, printable PDF file for usage instructions. 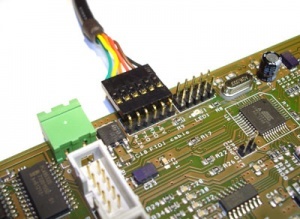 For fast board configuration you may use a serial connection through FTDI USB adaptor cable or USB interface connected to PL19 (black wire faces to black connector PL17. (Alternatively, you may use the USB port or even the MIDI IN/OUT jacks through a third-party USB to MIDI interface.) See page HX3.5 Editor for details. If you want to install other configuration options via SD card, download appropriate firmware for SD card from our Github Repo and store ZIP contents on SD card (root directory). Insert card into HX3.5 SD card adaptor and reboot HX3.5, so autorun.ini script contained will do all updates automatically. Please note: Even with new firmware installed, some System Init settings are persistent and must be changed to get your configuration working. Advanced users may create their own INI scripts containig all neccessary commands which do basically the same as HX3.5 Editor. See page HX3.5 SD Card Usage for details. Alternatively, connect HX3.5 to your PC either by FTDI cable (option) or USB MIDI. Start HX3.5 Editor, connect to HX3.5 and open HX3.5 Update/Finalize window. Complete or partly updates may be triggered by pull-down menus. "Get Board Info" should show current configuration. See page HX3.5 Editor User Manual for details. Is MIDI IN working? Brand new boards should deliver a basic organ sound on audio outputs with MIDI input on MIDI channel 1. Right 5-pin DIN connector (seen from back) is always a MIDI IN. Is an appropiate Scan Driver installed? Should be either MIDI Input (HX3 mk5 MIDI Expander or Drawbar Expander FW) or FatarScan driver (other firmwares). You may replace the Scan Driver with help of HX3.5 Editor. Use pull-down menus and select "Scan Driver file". HX3.5 Editor will prompt for a DAT file, open either scanmidi.dat or scanfatr.dat, depending on your needs. Are HX3.5 System Inits correct? HX3.5 will not scan buttons or analog inputs if not set correctly. Go to HX3.5 main window and click on pink System Inits button. Click Get Group to refresh table entries. Are analog drawbar inputs working? With all analog inputs enabled (parameter 1503=2), check if changes on drawbars are to be seen on Upper DB rsp. all other analog input groups when clicking Get Group button. Are analog volume inputs working? Non-working analog inputs may have been remapped to "not assigned". See Analog Remap group. See page HX3.5 Editor User Manual or page HX3.5 SD Card Usage for details. See page HX3.5 DSP Updates for details. Adding hardware to your HX3.5 board may requires some parameter tweaking to get it running. By factory, HX3.5 is configured as a MIDI expander; it will not poll or drive any peripherals attached except the MenuPanel. For example, if you attach the FatarScan2 board, you need to update the scan driver as well. If you attach drawbars, buttons or switches, you need to enable these. As of today, tweaking parameters that are not present in the menu system is only possible by HX3.5 Editor. The serial connection's plain text protocol is similar to the HX3.4 protocol (see [HX3 Remote Application] page). However, lots of parameters have been added and renumbered, so HX3.4 Remote will not work with HX3.5. For +5V phantom supply on MIDI IN set jumpers on pins 7-8 and 9-10. When phantom supply jumpers are installed, DIN jack carries ground on middle pin 2 and +5V on two otherwise unused outer pins 1 and 3. MIDI over USB is available if USB socket PL3 is installed, Mini USB socket adaptor (optional) or HX3.5 Extension Board is connected by cable to PL32. Please note: Due to hardware restrictions, MIDI IN2 and USB MIDI IN must not be used simultaneously. Transmission errors will occur! As opposed to HX3.4, the new HX3.5 features an USB controller. An USB type B connector may be soldered to position PL3 if needed. It is not populated by factory to ensure mechanical compatibility with existing back panels. In addition, the USB signal is available on header PL32 (near USB jack) to route USB to our HX3.5 extension board. The USB port is configured as a "MIDI over USB" device by default. In DFU update mode it becomes the port for the HX3.5 DSP update application. Important: When using a "MIDI over USB" connection (as the HX3 Editor does), disconnect any MIDI device from secondary (left) MIDI input DIN jack as they share the same MIDI input line. USB port is also used for DSP firmware or soundbank updates by a SD card script or HX3.5 Editor command. In this case, USB MIDI connection is closed and a DFU connection is established for time of update. In addition to left/right 1/4" audio jacks, the stereo audio signal is present on PL4 (center = analog ground). HX3 provides 24 analog inputs, all located on pin headers PL22 and PL23. All analog inputs are DC controlled. Input voltage range is from 0V (off or minimal volume) to +3.3V (max. volume). With factory configuration all analog inputs are disabled, so that HX3 may be used without any switches/drawbars/pots connected. You may leave internal connectors PL22 and PL23 open if you plan to control by MIDI only. To enable analog control inputs, use the HX3.5 Editor application to set parameter 1503 to value 2 (HX3 mk4 compatibilty). In this configuration, no enabled analog input may be left open; floating inputs will generate unpredictable sound events. Note: Individual analog inputs may be disabled or re-routed in the HX3 Editor Analog Remap section, parameters 5000 to 5063. Lower manual configuration with Drawbar12 (A# preset key, left) and Drawbar9-MPX (B preset key, right). Connects to HX3 via long flat ribbon cable (right). Upper manual configuration is similar, but uses Drawbar9 or Drawbar11 instead of Drawbar12. Connection to our drawbar boards Drawbar9 and Drawbar12 is simple: Drawbar9 (upper) connects to PL22 ANLG UPR, Drawbar12 (lower) connects to PL23 ANLG LWR via 16-wire flat ribbon cable (length up to 1m, plugs wired 1:1). Drawbar9 provides 3-pin headers for connection of Tone and Amp122 Volume pots. Additional Drawbar9-MPX boards may be inserted for "two drawbar sets per manual" configurations. Note that Drawbar9-MPX must be the drawbar set on the right-hand side for each manual as on Hammond Consoles (see picture). Drawbar9 and Drawbar11/12 are compatible and interchangeable, despite additional drawbars for bass pedals resp. tone/amp volume. You may also use your own or existing drawbars as follows: At least connect 9 drawbars or slider pots and Leslie volume control pot to PL22 ANLG UPR. R value should be in the 10 kOhm to 47 kOhm range, linear taper (for example type B10K). Note that using audio taper (log.) drawbar pots as found in various older LSI and transistor organs will not yield correct loudness and drawbar position on MenuPanel display. Any analog input may be "soft wired" to any analog function with HX3.5 Editor's Analog Remap section. By default, analog functions are mapped to keep HX3.4 compatibility as shown below. Vibrato rotary switch connection to PL24 VIBSW. Disregard "PL5" lettering in schematic. First contact lug is not used! Even with MIDI control, a swell pedal should be connected to SWELL jack for faster response. This overrides MIDI volume control. You may connect a swell pedal like Yamaha FC-7 or a simple volume pot to the SWELL jack. HX3 mainboard is set to tone/treble and amp volume control inputs active by factory (may be altered also with HX3.5 Editor). Tone pot center is connected to pin 10 of PL22. Pin 11 becomes the Leslie amp volume/drive control (mandatory). Amp volume pot center is connected to pin 11 of PL22. 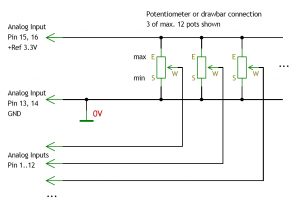 Both pots begin with GND and end with Ref 3.3V+. Please note: Open analog inputs (unconnected) will "float" and change randomly, even with presets active. Tie unused inputs to ground or fixed level (i.e. by trimpot) or disable them with HX3.5 Editor's Analog Remap section (set to "Not assigned"). HX3.5 provides 16 digital inputs plus one rotary swich input. Switches are defined as tab stops, rocker or toggle switches, buttons are momentary switch contacts, normally open. All inputs are active low, i.e. tie to ground when switch/button is operated. You may leave the switch connectors open if you plan to control by MIDI only. Parameter 1504 in HX3.5 Editor's System Inits determines if PL26 (lower row of Panel16) left four switches (pin 1 to 4) are configured as assignable button inputs, as V1..V3 V/C vibrato selectors or as common preset selectors. Individual digital inputs may be enabled/disabled or re-routed in the HX3 Editor Switch Remap section, parameters 5100 to 5163. Easiest solution for a register/stop panel is using our Panel16 board connected to PL25 PERC/VIBON/LESL and PL26 PRESET/EFX/SPLIT by two 10-wire flat ribbon cables. Panel 16 provides 16 buttons for complete HX3 control; just add the rotary switch for vibrato depth. Set parameter 1504 to 2 for this purpose. Note: Buttons not used for Common Presets or V1..V3 V/C may be remapped deliberately to desired functions by altering the Switch Remap table in the HX3 Editor application. Instead of Panel16 you may also connect your own buttons or tab switches (up to 16). Every function is activated by either a button or a switch (dependant on Button Mask parameter in HX3.5 Editor's System Inits) on digital inputs PL25/PL26. For buttons, a momentary contact to ground on each PL25/PL26 pin will toggle its status and drive indicator LEDs (see schematic). Leave unused digital inputs open. To use tab stop switches, define P22 and PL23 inputs as switches by HX3 Editor Application, "System Inits" parameter page. Check boxes in "ButtonMask" parameter row 1499 and 1500 to define an input pin as a switch instead of a button. The rightmost check box represents Pin 1 and so forth, up to leftmost box for pin 8. When using buttons, an indicator LED should be installed as shown; otherwise there is no indication if a tab stop is on or off. HX3.5 board does provide 4 "common" presets (see Pinout PL23) for both upper and lower manual. It may be extended to 2x8, 2x12 or 2x16 presets with optional boards Preset12-2 or Preset16 (one or two). All connect to HX3 PL21 by 10-wire flat ribbon cable. HX3 PL21 is a I2C bus system, so all boards connect in parallel (use multiple 10-pin plugs on one cable if necessary); Preset12 and Preset16 provide an extension route-through connector for adding more boards. Cable length on HX3 PL21 should not exceed 100 cm (40") in total. Use appropriate firmware for each preset solution. See description of each product for details. Discontinued boards are still supported by newer firmware issues. Two daisy-chained Preset 16 boards connected to PL21 PANEL. Optional MenuPanel may be connected to last Preset16 board. Preset 16 is a self-contained panel with 2 rows of 8 LED buttons each. It connects to HX3 PL21 by a 10-wire flat ribbon cable. A second Preset 16 may be connected to second 10-pin header (daisy-chain). Both 10-pin headers on Preset16 may be used (are wired in parallel). A jumper set on Preset16 selects upper manual. If jumper is absent, Preset16 works on lower manual. If only one Preset16 is connected, jumper JP1 must be set on preset board. Now upper row of buttons is for upper manual, lower row for lower manual (i.e. 8 presets each). This preset split function may be overridden by param 1505 in HX3 Editor set to ON. If using 2 sets of drawbars per manual by using DB9-MPX drawbar boards (one DB9-MPX plus one standard drawbar board per menual), set HX3 Editor "System Inits" parameter 1496 "2nd Drawbar Select Voice Number" to 1. This will activate 1st drawbar set on Preset 0, 2nd drawbar set on Preset 1. Preset12-2 board connects to HX3 PL21. Flat ribbon cable may be extended with additional connector to accomodate MenuPanel. Preset12-2 is an interface board for up to 2 x 12 "inverted" preset keys (with optional LED indicators) as found on Hammond console organs. Preset16 PCB is similar to Panel16, but has additional circuitry and connects to HX3.5 PL21 by a 10-wire flat ribbon cable. 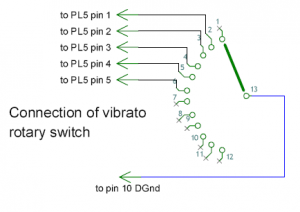 See schematics for pin designation. Pin 1 of both 14-pin headers is Preset 0 = Live (right drawbar set) = B key, pin 2 is Preset 1 = Live (left drawbar set) etc. downto pin 12 = CANCEL key. Standard organ firmware supports momentary contacts. To save a preset, press and hold preset key/button for 2 seconds. When using 2 sets of drawbars per manual by DB9-MPX drawbars/multiplexer and Preset12-2 board, set HX3 Editor "System Inits" parameter 1496 "2nd Drawbar Select Voice Number" to 1. Switching from drawbar sets A#/B is only active when no Overall Preset is on (Overall Preset "Live" mode #0). When an Overall Preset (#1..#15) is selected, always the right drawbar set is active, even with A# key Drawbar Voice. 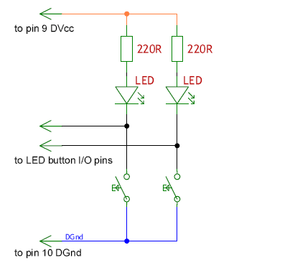 LED outputs have on-board 220 Ohms resistors, resulting in 15 mA LED current. Long leg of LEDs is anode (+), short leg is cathode (-). New in firmware #5.408 and up: Parameter #1508 switches from normal (button type) keys to "Latching Keys" mode (drawbar voice presets as found on old Hammond consoles). In this case, saving a voice is accomplished by holding the "Cancel" key and destination voice preset key down for at least 2 seconds. Note: The old Preset12-MPX boards for HX3 mk2/mk3 may be used as well for HX3 mk4 and mk5 along with two sets of non-MPX drawbar boards. They do not offer a variable preset number for second drawbar set, though. Instead, second drawbar set is hard-wired to Voice Preset 15. So you have to change 2nd drawbar set number in parameter #1496 to 15, not to 1 when using Preset12-MPX. For lowest key-to-audio latency we recommend direct keyboard connection via scan board (different versions available). Scan boards are activated by update from SD card (appropriate for your application) or HX3 Editor. Upload driver scanmidi.dat, scanfatr.dat resp. scansr61.dat to HX3.5 using Update/Finalize window. All Scan drivers will support MIDI input/output too, but for pure MIDI remote we recommend MIDI input driver scanmidi.dat. New HX3.5 boards come with scanmidi.dat installed. A single FatarScan2 board is connected to HX3.5 PL9 FATAR SCAN. One or two Fatar 61 key manuals (type TP/8O or similar) may be connected to one FatarScan2 board using a special cable set (MicroMatch connectors to keyboard scanning strips). See page Anschluss der Scan-Platine FatarScan2 (German language) for more pictures. We recommend buying the FatarScan2 cable set for connection to MicroMatch headers on Fatar keybeds (one set for each manual). A FatarScan2 board must be connected to PL9 if using the FatarScan driver, otherwise loud noise will be heard. Bass pedals may be connected to an additional Scan16-Strip, Scan61-Inline or Bass25 board wired to HX3 PL13 (!). FatarScan2 boards are activated by update from SD card or HX3 Editor application. Upload driver scanfatr.dat to HX3.5 using Update/Finalize window. Connection of Scan16 Strip or Scan61 to HX3 board (HX3.4 pictured). Note: HX3.5 has different PL designators, use PL13 (blue) for Scan16 Strip or Scan61. Please note: lowest key contact pad on Scan16 is always "C" key on 4- and 5-octave keybeds. On 61-key manuals, upper part of rightmost Scan16 board may be cut off as marked on PCB silk screen printing (or pads are left open). On 44-key manuals, lowest 5 pads are left open, manual(s) start with "F" key. On 49-key manuals, connect pad PL20 to highest "C" note. All contacts must switch to ground. Boards provide ground lugs for connection to busbar. Scan16 boards for one or two 49/61-key manuals is are activated by update from SD card or HX3 Editor application. Upload driver scansr61.dat to HX3.5 using Update/Finalize window. Please note: lowest key contact pad on Strip61-Inline is always "C" key. On shorter manuals, leave unused key inputs open. As on OrganScan61 or Scan16-Strip, all contacts must switch to ground. Boards provide ground lugs for connection to busbar. Scan61-Inline boards are activated by update from SD card or HX3 Editor application. Upload driver scansr61.dat to HX3.5 using Update/Finalize window. JP3 and JP4 solder bridges must be closed. 2-pin inline header PL9 also provides common ground for the busbar. Note: A third Scan16-Strip or Scan61-Inline board may alternatively be used for bass pedal instead of Bass25, using only the first 13 or 25 contact inputs. Set jumper JP3 on scan boards to enable them for bass pedal use. Bass25 MIDI is equipped with an own MIDI controller and MIDI output jack. It is connected to HX3.5 main board by 5-wire MIDI cable. Bass25 MIDI provides in-line headers and a 26-pin flat ribbon cable connector for alternative connection of bass pedal contacts. 2-pin inline header PL9 also provides common ground for the busbar. JP3 solder bridge must be closed. JP4 solder bridge must be closed if Bass25 MIDI is powered by phantom supply from HX3 board, left MIDI input jack (seen from back). MIDI phantom power jumpers on HX3 board must be inserted. For separate power supply (internal +5V or external 9V DC wall wart), open JP4 solder bridge. Use 2-pin header PL12 next to MIDI OUT jack to supply internal +5V: Pin 1 (left, facing towards diode) is VCC +5V, pin 2 (right) is ground (refer to PDF schematics in our Github repo folder PLATINEN/BASS25). A +5V MIDI phantom supply on outer pins of MIDI input may be obtained from HX3 mainboard by inserting two additional jumpers on HX3.5 PL18 pins 7-8 and 9-10. Do not install these jumpers if connecting other MIDI gear not using a phantom supply. Additional wires required to use HX3.5 with old HX3 mk3/mk4 Extension Board. An updated HX3 Extension Board mk5 is available for Leslie and headphones connection. The old Extension Board for HX3.4 (mk3/mk4) may be used after removing two resistors from the Extension Board and soldering two wires on the rear side of the HX3.5 mainboard from Extension Board connector to serial port. Route one wire from PL1 pin 10 to PL19 pin 4 and one wire from PL1 pin 11 to PL19 pin 5 (see picture). See page HX3.5 Extension Board for details. Diese Seite wurde zuletzt am 23. Februar 2019 um 15:10 Uhr geändert.